Acorn Hill Academy: The Eyes Have It! The kids and I went to the eye doctor this week. Usually, this is not a significant event in our lives, but this time there were several surprises. 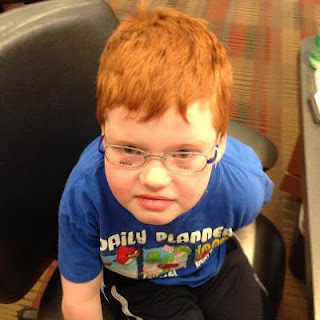 Isaac, who is 5, needs glasses. Apparently, he has quite an astigmatism in one eye. This could explain why school has been such a struggle this year. Thinking back, he does try to write with his face up close to the paper, like I do when I am not wearing my glasses, but it wasn't until the day before our appointment that I had an inkling of his near-sightedness. He was thrilled to choose his frames, and almost immediately identified a bright blue pair. Of course, he had to try on as many kid frames as he could reach, he didn't break anything, and it did serve to keep him occupied while we completed the order. I feel a little guilty for not noticing that he couldn't see. I feel I should have expected it, given our family eye history. The very nice young woman who fitted our glasses told me that children often don't know they can't well, because they don't know any differently. I am sure she's right, but I still wish I'd been paying more attention. It also makes me more than a little sad to put those big beautiful eyes behind glasses, but I'm thrilled that he will be able to see better now. These are supposed to be "boy-proof" frames. He's not the first little boy to wear glasses, to I'm sure manufacturers know how to make them so they last longer than 5 minutes. We will see! The girls had appointments together on another day. Abbie has worn glasses for 3 years, and Emma has never needed them. According to the eye doctor, Abbie should NOT need glasses at all, and Emma does! He was pretty confused to see Abbie with glasses on. Abbie was quite distraught when she was told she didn't really need her glasses. She gets a lot of headaches, and she says her glasses help. Also, she doesn't want to "look different," she told me. I think she has a fair amount of her identity wrapped up in wearing glasses. Most kids would be delighted not to need them, but not my girl. We did get her a new pair, since she's grown quite a bit since she got her old ones, and they look pretty rough. The optometrist also recommended a pair of very low strength reading glasses, +.25. He thought they might help with her headaches, since they often come on when she's reading. Those are not easy to find, and I may have to order them online. If you've seen some, please let me know where! Emma, who does need glasses, insists that she doesn't want any. She said it will be too much responsibility and she's sure she will lose them. The doctor said she doesn't need them badly enough to insist she wear them, but she should prepare herself, because she will need them in a year or two, almost certainly by the time she starts driving. I'm going to pretend he didn't say that. I'm fine with glasses, but I refuse to think about her driving yet. God is really challenging my place in the land of denial lately! Why is this worth blogging about? I don't know. Lots of unexpected things happened at our house this week, so perhaps this is a bigger deal than it would otherwise have been. My children certainly keep me on my toes and make life interesting!